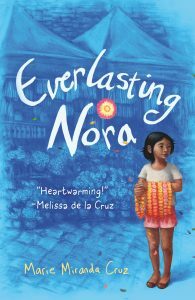 With the publication of Everlasting Nora (Starscape/Tor, Oct. 2018; Gr 3-6), Marie Miranda Cruz fulfills a long-standing dream of exploring her cultural heritage and telling an authentic contemporary story about life in the Philippines. Her protagonist is a 12-year-old girl who drops out of school and, along with her grieving mom, becomes a squatter in her father's grave house in a Manila cemetery. This is our email conversation about how this project came about and what we have to look forward to from this crafty scientist and writer. Congrats on your first middle grade novel. I read on your blog that writing and publishing this book was a 12-year journey. Wow. What kept you going and gave you hope throughout the process? I’d have to say the first two things that kept me going were dogged determination to hone my craft and a deep passion for writing for children. Everlasting Nora was the first novel I wrote. After completing my draft in 2007, I joined my first critique group, I signed up for workshops on craft, and I went to conferences for writers to learn about the publishing industry. Over the years, I revised Everlasting Nora a few times and drafted two more novels, both young adult, along the way. That last and most important thing that gave me hope and kept me from quitting was all the friends I made during those first years as an aspiring author. The kid lit community is so wonderful, so accommodating, and the most encouraging people I know. Everyone, including the authors I’ve met, made the community feel like family. Keeping that connection with other writers is so very vital. Other writers know how hard the work is. They know all about the frustrations and the pain of rejection. Connecting with my writer friends through the years inspired me to keep writing and helped me realize that I wasn’t alone in my struggles. My critique partner and friend Nicole Popel would always say, “Each NO is just one step closer to a YES.” You are a scientist in your other life. How do your discipline and work ethic as a scientist inform your work as a novelist? Great question! I work in a laboratory where we follow strict procedures when analyzing chromosomes. I am very familiar with their structure and can recognize anomalies in any given cell. Before that I worked as a computer programmer and wrote and revised lines of code. In both of these professions, I was immersed in patterns and lines of logic. So as a writer, I loved studying structure and plot. I outline and plan at both the draft and revision phases of a novel. I love having a road map to follow. Even then the creative process will surprise me and lead me off in directions I didn’t think of. It’s the best part of writing. Are there bits of 12-year-old Marie in Nora’s personality? Is that where her love of learning and burning desire for an education come from? There are definitely bits of me in Nora’s personality. I’d say the planner in me is part of her. When I set my sights on a goal, I come up with a plan to achieve it. Nora does this by thinking of better ways to make and save money in the book, like saving for a manicure/pedicure kit so she can do manicures for clients in their homes. Her craft skills come from me as well. I love making things. I knit, crochet, and quilt. So it was a lot of fun incorporating this aspect into Nora’s life. The book touches on some heavy issues—including parental failures, hunger, and gang violence—but, along with Nora, readers discover a vibrant, caring, intergenerational community within the wall of the cemetery, with people looking out for one another’s safety and welfare. Was this based on your research? This aspect of community resiliency and hope is based both on research and my own experience living in the Philippines—intergenerational community, looking out for one another. These were things I experienced as a child within my huge extended family and what I observed among the adults who lived in my neighborhood. One of the things Filipinos are known for is hospitality. In all households you visit, your host would insist on serving you food and drink, and usually, they will serve you the best of what they have in their kitchens. This is even true among Filipinos who live abroad. I know a group of ladies who share food with one another every day. The word we have for this is pakikisama, which means fellowship. It’s one of my favorite aspects of Filipino culture. To me, the richness of the cultural details that you weave into your story is what sets it apart from the heaps of middle grade novels out there. Hopefully, you did not get any pushback on including Tagalog words and phrases. Are there plans to do an audiobook version? 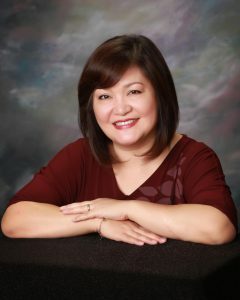 I was very fortunate in my editor, Diana Pho, who loved all the Tagalog words and phrases! I’m so glad, because I feel readers' immersion into Nora’s world would have been incomplete without it. And yes, there are plans for an audiobook. I’m very excited to see who the narrator will be! You've stated that part of your impetus to write this book was a dearth of children's books that had Filipino characters or had anything to do with Filipino culture. Did you worry that telling the story of a girl living in Manila and dealing with extreme poverty would reinforce stereotypes? Not at all. I wrote this story with the aim to portray Filipino people and culture as truthfully as possible. Nora’s story shows only a facet of Filipino society. While there is a great deal of extreme poverty, a great percentage of people are productive people, living and working in Manila. My novel offers glimpses of many people in all walks of life. You will see students, business owners, law enforcement, and folks who work in public transportation. It’s my hope that the lives portrayed in my book embody the culture and are not defined by their circumstance or cast into stereotypes. Now that you've got Everlasting Nora under your belt, are you hard at work on a new project? Yes! I am working on another middle grade novel, about sisters who reunite on an island resort. It’s about friendship, sisterhood, and healing with a little Filipino mysticism mixed in.